City Hall. Photo by Kelsey Shoemaker. The city won't let individuals with two or more felonies serve on a board or commission. Last year’s ouster of an outspoken member of the Parks Board has spurred an effort from activists and some councilmembers to scrub a rule that bars any individual who has been convicted of two or more felonies from serving on a board or a commission. The city secretary promptly removed Rollins from his appointed position, which alerted some of the council to the provision’s existence. 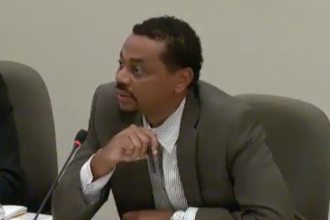 “If individuals have repaid their debt to society and they were convicted of a felony so many years ago, I believe that these individuals need to have an opportunity to serve on boards just like anyone else,” says Councilmember Scott Griggs, who represents North Oak Cliff. 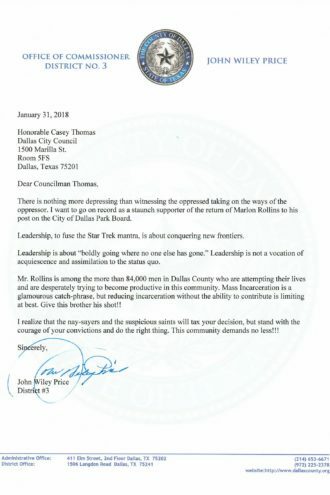 Rollins’ time on the Parks Board was marked by his hard questions about how the State Fair of Texas spent its money. He was one of five on the board to get up and walk out in protest of a deal to hand management of Fair Park to a private entity run by former Hunt Oil executive Walt Humann. This context, combined with his abrupt ouster after two years on the board, fueled conspiracy theories about why someone went and dug up his background. There were also questions raised about where he lived, which included a voting record from Arlington. 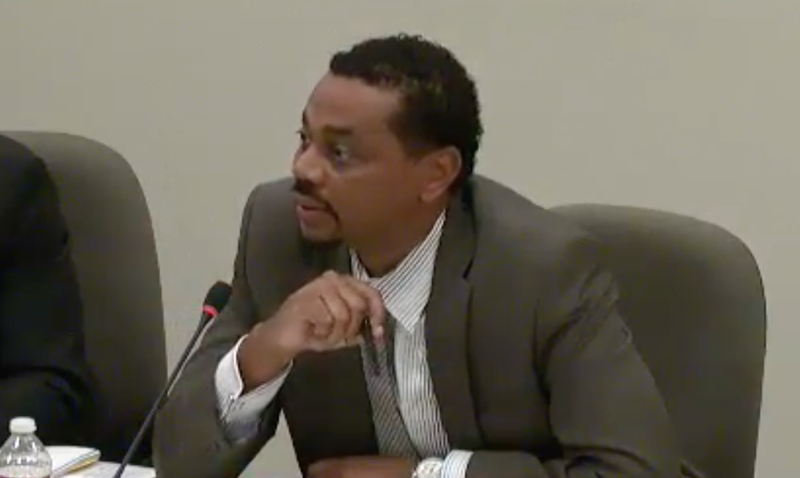 Marlon Rollins at an October park board meeting. So, like any City Hall intrigue, there’s a healthy mix of politics and general confusion. Those who have spoken in support of changing the rule, including District 14’s Philip Kingston and District 7’s Kevin Felder, insist they’re just doing what’s right. 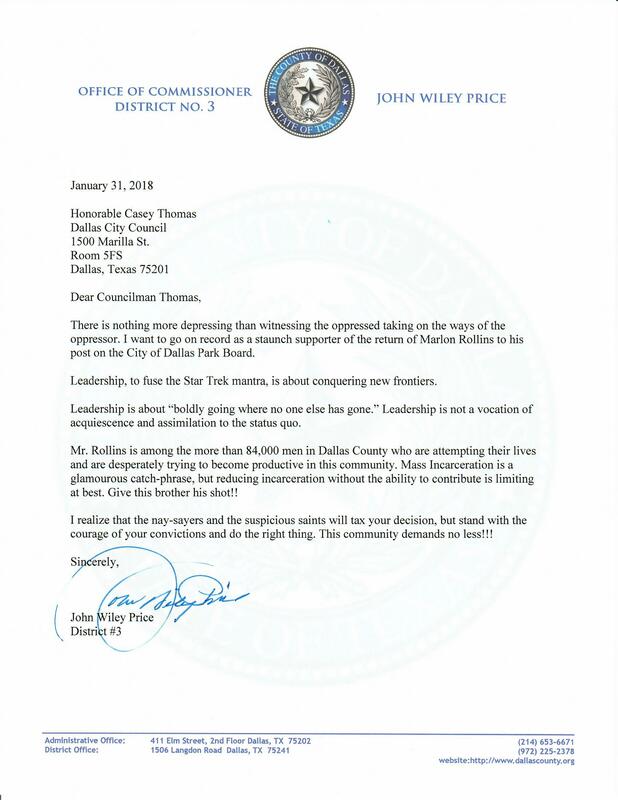 The letter Commissioner John Wiley Price sent to Councilman Casey Thomas. Click to make it larger. The push to change the code reignites the conversation of how we treat the men and women who are released from prison. In Austin, an ex-offender is suing to run for council. Current Texas law requires individuals to have been “released from the resulting disabilities” of their sentence, which is vague and subjectively worded—apparently, the Texas secretary of state interprets that to mean a pardon. The stakes aren’t as high here. But activists say the gist is the same: Barring these people from any sort of public service sends a message that they’ll be marked forever, despite having served their sentence. A number of local nonprofits have lined up behind changing the rule, including Unlocking Doors, which helps integrate ex-offenders into society, and Miles of Freedom, another reintegration nonprofit started by the exoneree Richard Miles. Rev. Omar Jahwar, the community activist and pastor at Kingdom Worship and Restoration Church, said he was also alerted to the ordinance by Rollins’ removal. Others on the council did not respond to messages requesting comment or, like Mayor Mike Rawlings, said they didn’t have enough information to chat about changing the rule. Thomas, who appointed Rollins, wouldn’t comment. Jahwar said he spoke with Thomas after Rollins was removed; the councilman promised to look at the existing ordinance. In recent years, Republicans and Democrats alike have begun exploring criminal justice reform. Years of tough-on-crime policies coincided with building more jails to house more offenders. In 2010, Texas had 173,000 prisoners in its holding cells, a jump of 346 percent over 20 years. The Washington Post, in 2014, used Texas as a sort of model for the country, and not for why you think. By 2007, the cost to house the increase in prisoners was sitting at half a billion dollars. The legislature decided something had to change. And three legislators figured out a plan forward, establishing treatment programs and diversionary options that judges and district attorneys could deploy. Today, according to the Texas Tribune, the state houses 142,040 inmates. (The incarceration rate is still high enough to get Texas in the nation’s 10 highest.) Texas has actually closed jails. And each year, about 14,000 ex-offenders wind up in North Texas, according to data from Unlocking Doors. According to a legislative budget board brief presented to lawmakers last year, the three-year recidivism rate for those released from prison in 2013 hovered at around 46.4 percent. For those on adult probation, it fell to 35.9 percent. Griggs says he thought a buffer of seven years would be appropriate for convicted felons to serve on boards. “If they’ve been incarcerated or involved in the system at all and if they haven’t done anything by seven years, they’re going to be pretty solid,” says Crain, who is also a former chair of the Texas Department of Criminal Justice. To change the city’s code, the next step will be for a councilmember to submit the draft resolution to the mayor for consideration, with four support signatures. It’s not clear who will take the lead. If the rule changes, Kingston believes Rollins could be reappointed. Thomas again declined to comment on the matter Friday morning.